Skating with a shotgun start. The first Winter Games outside Europe involved a long and expensive journey for the 19 Norwegian competitors. 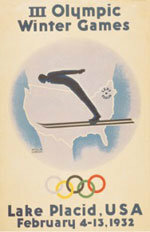 The most remarkable innovation was that the speed skating events were held with simultaneous starts, as in athletics. In Norwegian eyes, the effect was a parody of the real sport. Speed skating for women was held as a demonstration event.